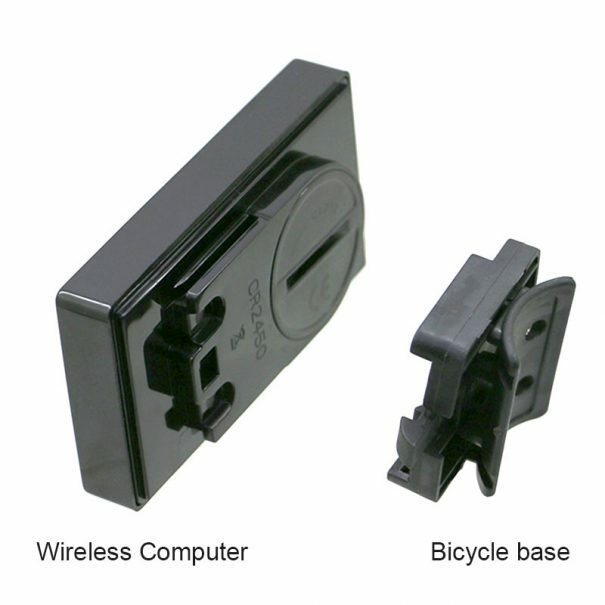 Attach the bike computer base on to the handlebar by cable tie, if you want to install it on the vertical handle bar , open 4 screws of the bike computer base, rotate the soft gasket to 90 degree and make it touching the handlebar; then tighten the screws. 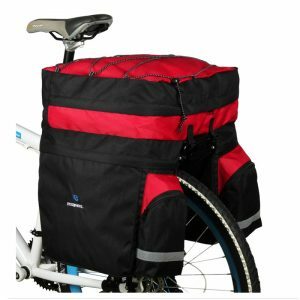 The bike computer can completely slide down to the chute of bike computer base, which has card slots to prevent bike computer pulling out accidently. Check the installation: twirl front wheel, check the whether the number on bike computer changes. If not, adjust the position of magnet and launcher appropriately then try again. Screw the magnet on spoke. Then use zip tires to fix the sensor on the front fork by the same side of spoke magnet. Then, adjust the distance of magnet and sensor, and keep its relative position in 3mm (the smaller the batter, in the basic of not touching each other). The spoke magnet can work effectively while mounted against both sides of sensor; but not works when it was attached against the middle of sensor. Press button (L) for 6 secs to change different wheel. Wheel circumference 2 set up – the Default value is 1860mm, follow the second step to set up. Mileage Maintenance 1 – the Default value is 0200. The setting order is from right to left, press button(R) to change the number and press button (L) to confirm. Mileage Maintenance 2 – the Default value is 0800. The setting order is from right to left, press button(R) to change the number and press button (L) to confirm. 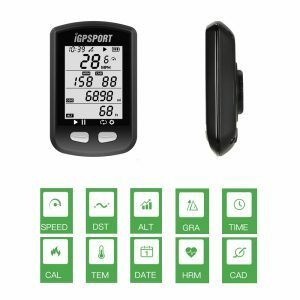 Fuel consumption setting – fuel consumption per kilometer. The setting order is from right to left, press button(R) to change the number and press button (L) to confirm. 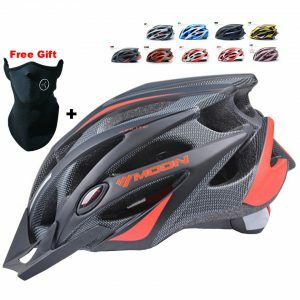 Since now, you have completed the initial setting of bike computer, and it can be used during your cycling. The wheel circumference 1 is the default value, which is set in step 2 and 6; and it has the number “1” on the top left for distinguishing. *Tips: The above values can be reset by press both “M” and “S” buttons for 6s. Enter circumference range: 0mm-9999mm, the Tire circumference can be measured as following way: firstly, turn the tire air faucet down to the ground, mark the corresponding ground. Next, push the bicycle within a straight line and make the wheel spin a round, when the tire air faucet turn down to the ground, mark the second sign. Then, measure the distance between two signs, which is exactly the wheel circumference. If the measured value is 1.615m, you should input the number as 1615. There are three display pages: Total Riding Distance (ODO)– One Way (CAL) – One Way (MAX), you can press button(R) to switch these three pages. Under the total mileage mode: press button(L), mileage – CO2 – Clock symbol will flash successively. You can press button(R) 3s to get into the total distance setting, when the total distance (ODO)symbol flashing. According to your needs entering values, the setting order is from right to left, press button(R) to change the number and press button(L) to confirm. When CO2 flashing, you can press button(R) 3s to reset up the fuel consumption rate; you can press button(R) to change the number and press button(L) to confirm. This value is the fuel consumption of each KM. 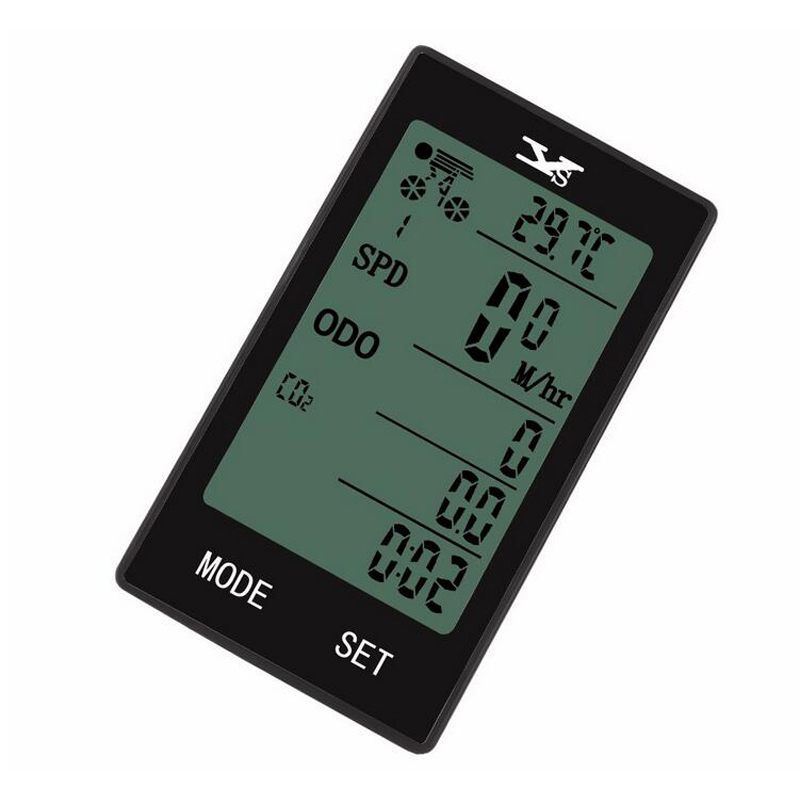 During your cycling, the value show on the bike computer is CO2 production value according to the fuel consumption, the measure unit is KG. 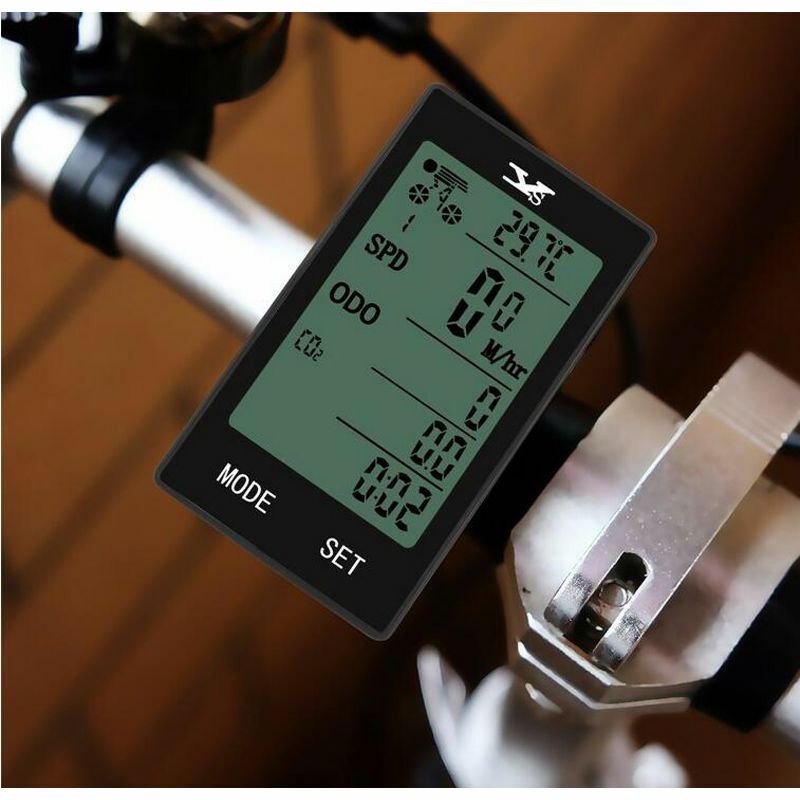 For example, the initial default value is 0.19L/KM, which means, during the 1KM cycling there are 0.257KG CO2 produced. The CO2 value is corresponded to the one-way mileage. So, it will be cleared, when the one-way mileage clear. The clock symbol flashing, you can set up time by pressing button(R) for 3s. You should set Year/Month/Day first; the setting order is from right to left, press button(R) to change the number and press button(L) to confirm. Then, set time in the same way. 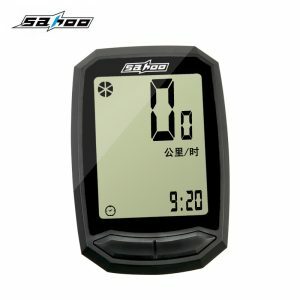 Under the one-way mode, press button(R) for 3s to reset one-way, average speed, max-speed, cycling time and calories. Calories: calories consumed during the single way cycling, range at0.0-99999.0. 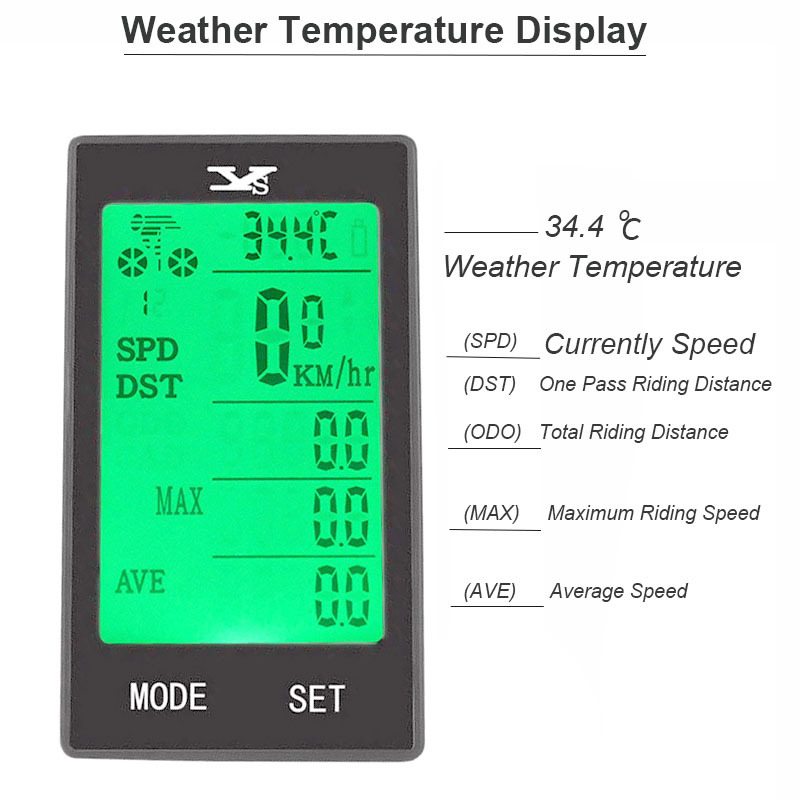 Real-speed: current riding speed, the accuracy is 0.1 Km(M)/h, range at 0.0-99.9 Km(M)/h. Light: during the night at 17:00-07:00, the computer screen will turn light for 4s if you touch any buttons. If you need for a steady backlight, press button(R) and button(L) at the same time, and press again for turn off. Cancellation of Maintenance Symbol: under the One-way mode, press button(L) for 3s. Change the wheel diameter: under the One-way mode, press button button(L) for 6s. Low Power Warning: the battery symbol will show on screen remind you for changing batteries, if the electric decrease to 2.5V. 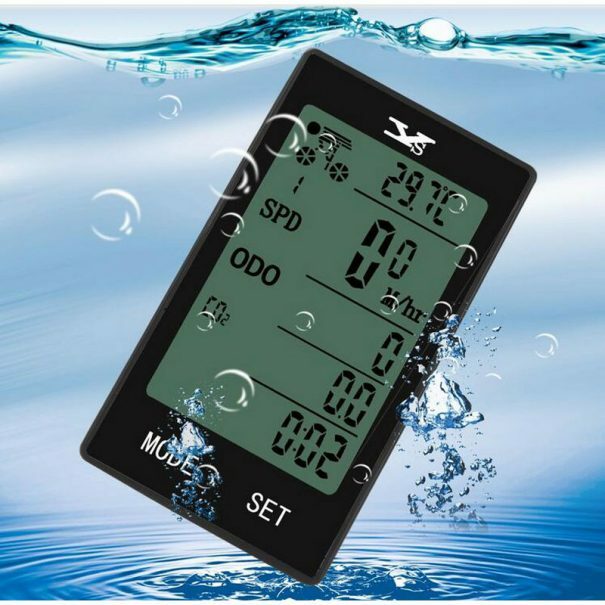 Power Saving Function: it will automatically enter sleep mode, if there is no operate signal for 3min. 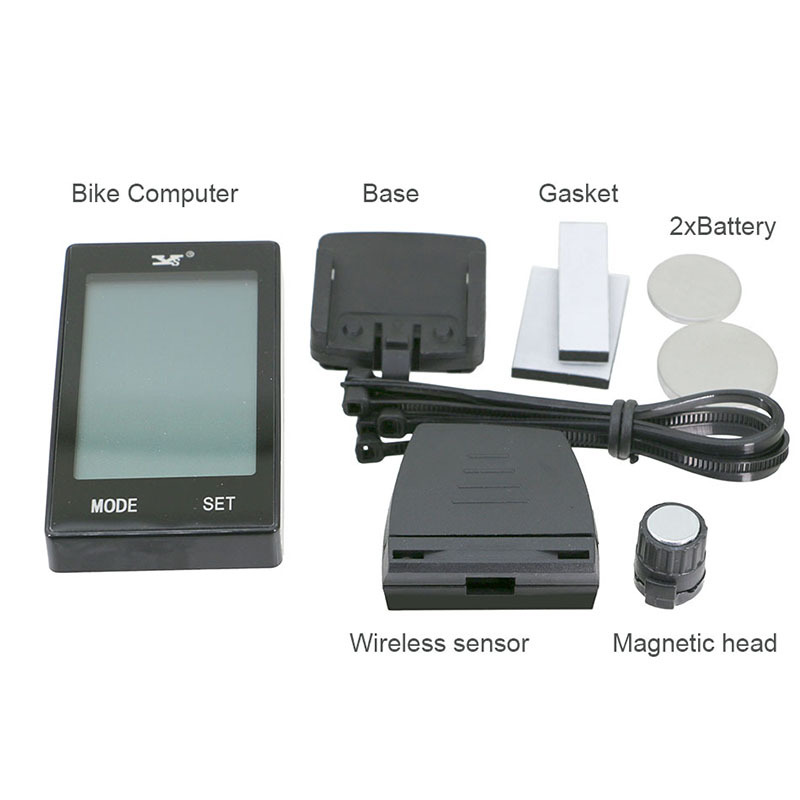 Figure Memory Function: the internal data of bike computer can be automatically stored; it won’t miss when it is no power. Check if the table base is anti-loaded, the mental on mounting shoe should touch the mental on the bottom of computer. Check if the magnet spoke is target to either two sides of sensor. 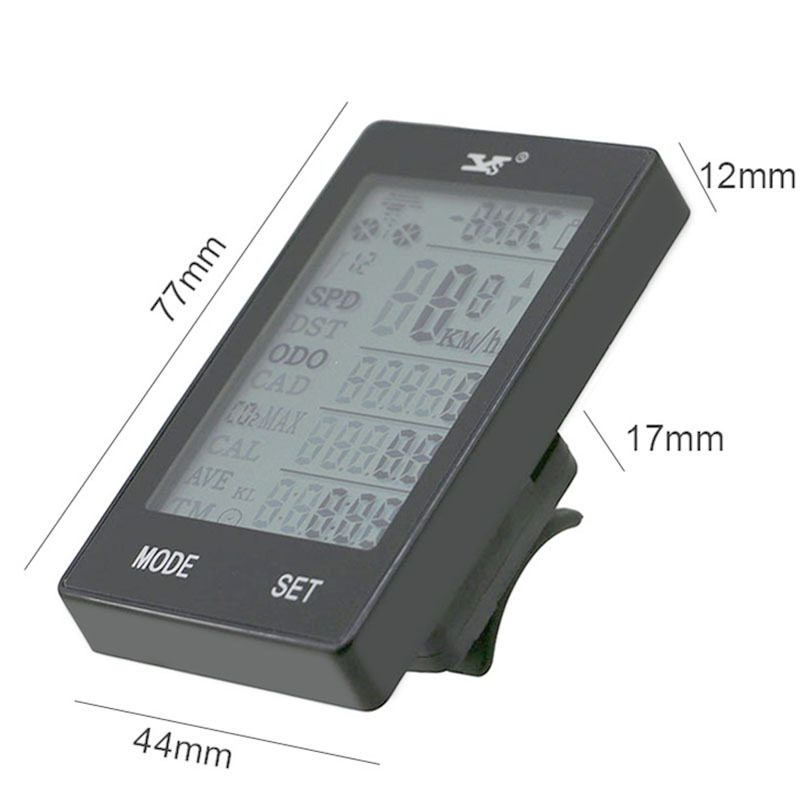 The frequently speed value change is always associate with the magnet spoke target to the middle of sensor. The wireless computer needs to be wake up, but the cable computer can auto-wake up. Check if the battery of sensor is well installed. “+” means your speed is quicker than the average speed; “-” means your speed is slower than the average speed. 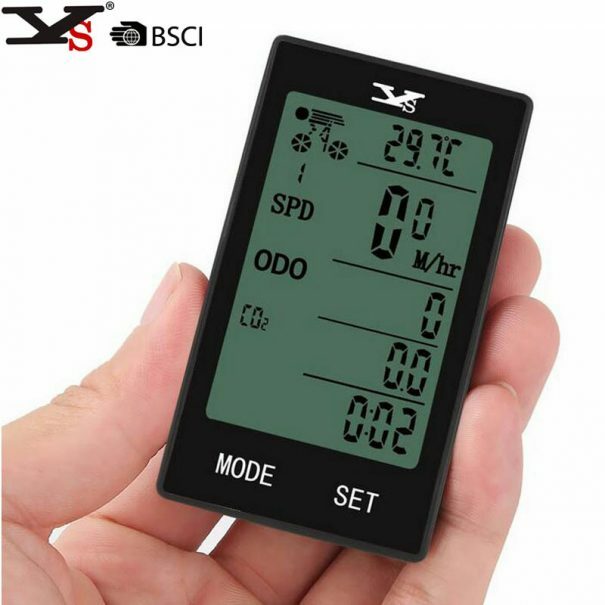 Check the setting, usually it is related to the wrong wheel circumference or measurement unit setting. The bike computer is not applicable for motorbike or vehicle. The internal data of bike computer can be automatically stored; it won’t miss when it is no power. Slow down the press speed, it cannot react as fast as your smart phone. It can be only installed on the front wheel. Check the battery; see if it is low power.